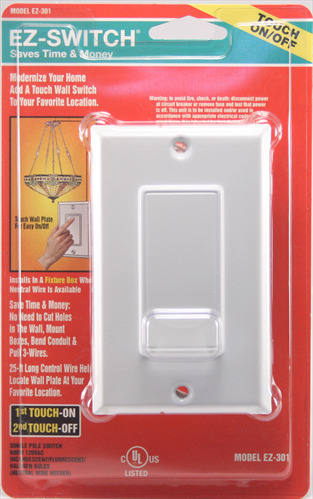 EZ-Switch provides a convenient touch-operated wall switch that can be placed at your favorite location. 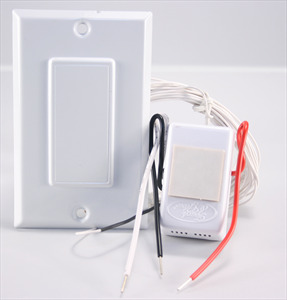 Install our EZ-301 switch module inside a fixture box or a wall box to provide easy touch on/off. Connect power, load and neutral wires from our module as shown in the diagram. Wall plate can be mounted at any convenient location on the wall or placed on a counter -top surface to provide easy touch on/off operation. It provides you with excellent flexibility to place the wall switch at your favorite location for every day convenience. You can also add additional (optional) wall plate model EZ-501 to operate this switch from multi-locations without hard wiring with 120VAC lines. It saves very significant time and money in installation costs. Switch works with incandescent, fluorescent and halogen bulbs and has extra large 600 Watts capacity 120VAC.